The Swiss stuns the Machine. Stan Wawrinka does not dream of winning majors and being no. 1. Before Sunday, he did not lie in bed and imagine himself lifting La Coupe des Mousquetaires. Making it to the final at Roland Garros? Yes, he would admit, he had hoped for that. But winning multiple majors in an era dominated by the same few names? “To me, the players that did that were mutants,” he said after his semifinal match. Novak Djokovic, Roger Federer, Rafa Nadal, and Andy Murray beat the players they are supposed to beat; they survive bad days and high expectations; they look at the lists of winners, knowing they belong. They are confident they’ll still win when they don’t play their best. They carry themselves differently. They are different. They assume their greatness. Wawrinka has spent the better part of his career learning to live with losing. What happened wasn’t a dream. Wawrinka beat the machine 4-6, 6-4, 6-3, 6-4, in a brilliant, heart-bursting match.“I lost to a better player who played some courageous tennis,” Djokovic said afterward. Courage. Yes, that’s what that was. Champions are associated with a certain kind of self-belief. Courage is something else. It fails; it is married to doubt. Courage goes for an ace and misses by inches. Courage double-faults. Watching Wawrinka can sometimes be painful. His face turns even redder than it already is; his body tightens; fear enters his eyes. His feet tangle; his racket head slows. This spring, he had a stretch in which he failed to make it past the third round, bottoming out against a slumping Grigor Dimitrov in 55 minutes in Monte Carlo — where he had been the defending champion. In the run-up to the French, the focus was on history. Would Nadal be able to win his 10th title? 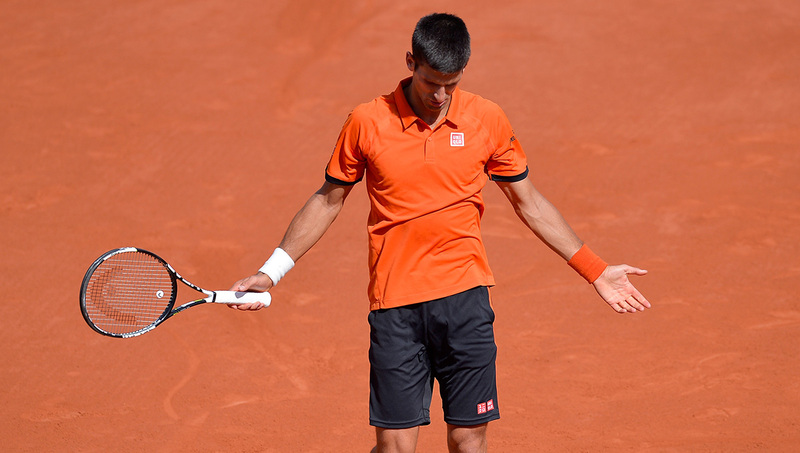 Would Djokovic, far and away the best player on tour, finally complete the career grand slam? Would Federer maintain his late-season form? Would Murray remain unbeaten on clay? To me, as to Wawrinka, those players are mutants. What they do physically is almost impossible; what they do mentally is unimaginable. What Wawrinka did was go to practice. He worked with his fitness trainer and his coach, Magnus Norman. He focused on his skills, his strokes. Wawrinka is at his best when he is aggressive. He plays first-strike tennis. He has perhaps the most powerful, brutal groundstrokes in the game, hitting the sweet spot between spin and speed to create a heavy, penetrating shot. The strength of his legs and core let him generate pace and angles off almost any ball; he’s dangerous from any spot on the court. But his game depends on creating chances and then taking them. Sometimes the chances don’t come; sometimes they don’t work out. No one mentioned Wawrinka through the first four rounds of the French. It wasn’t until he beat Federer in tough conditions — so thoroughly that by the end of the match Federer was not only beaten but demoralized — that people started to take note. Still, few thought he’d beat Djokovic. Including Wawrinka. He is a realist. He wouldn’t try to win the trophy. He would try to win each point. His goal was to give himself a chance. On Sunday, Wawrinka played exactly as well as he can — not better. He wasn’t inspired. He didn’t play out of his mind. He played at the edge of the limits his work had set for himself, not beyond. Failure and success, practice and process, skill and confidence. Courage. He would play 20-, 30-, 38-shot rallies without putting the ball past Djokovic, so he would hit the 39th. He would lose the first set playing well, so he would win the second playing better. He would go down break point against the best returner in the game, and he would save it. He took Djokovic’s acute angles and responded by ripping the ball down the line. By the time he lined up a far wide backhand in the fourth set, I had that feeling that I get watching Steph Curry these days. Before he’d even hit it, I knew it was going to curve around the post and find the corner. There were moments Stan could have blinked, and on another day he might have. When Djokovic ran out to a 3-0 lead in the fourth set, it was hard not to think we were headed to a fifth. When Wawrinka went down 40-0 on his serve at 4-4, having seen two break points slip away, it was hard not to see a turning point. Djokovic has become the master of escaping from danger and magicking a perfect fifth set. But Wawrinka didn’t let up. He wouldn’t lose another game. He would win his second match point with a perfect backhand winner down the line. It was classic Wawrinka: perfect and brave, at once surprising and not at all.